Where else can you go into a shop with €50 and come out with a whole outfit? Penneys, that's where! I've spent a small fortune in there in recent weeks, and I do mean small because I've bought so much with so little money. I've been favouring things for the house and new pyjamas recently because it's a tradition now to buy new jammies when autumn hits. But you can bet Joanne and I will be investigating their autumnal fashion once we're back from our holiday! Now, on to the job at hand. The generous team at Penneys have given us three €50 vouchers to give away, so what better way to kick off the blogoversary celebrations! Because the gift cards are in euro, this giveaway is just for those in the Republic of Ireland, but don't worry, we've more giveaways to come that are open internationally! Make sure to read the terms and conditions like a good child. So go ahead and enter your details in the Rafflecopter widget below and good luck! 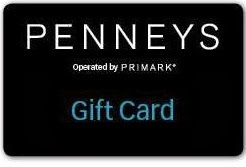 Oh I'd love to win I love Penneys. yep, I've got my eye on about 12 things... pick me! It'll help rescue the bank balance! Fab prize, love penneys - count me in please!